Yesterday we have posted some first impressions and initial results from AMD Radeon RX VEGA 64 with Ethash and Equihash and now it is time to get some more results. 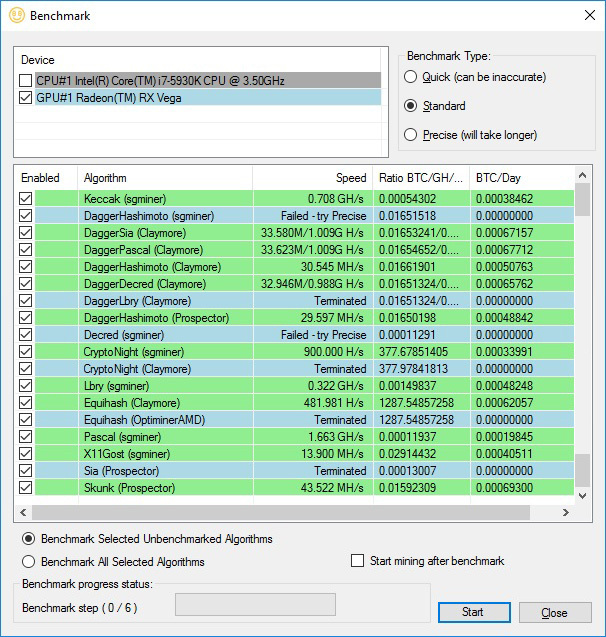 We ran a quick benchmark using the latest NiceHash Miner Legacy version 1.8.1.1 Pre-release 3. While the VEGA 64 may not perform outstanding for more memory intensive algorithms like the ones used by Ethereum (ETH) and Zcash (ZEC) it does perform very well in more GPU intensive algorithms. As expected dual-mining does work well and provides a nice bit of extra profit when compared to single Ethereum or Zcash only mining. As you can see however some of the miners included in the NiceHash Miner Legacy pack are having trouble working on the AMD Radeon RX VEGA 64 for the moment as not all of them apparently support properly the new GPU.